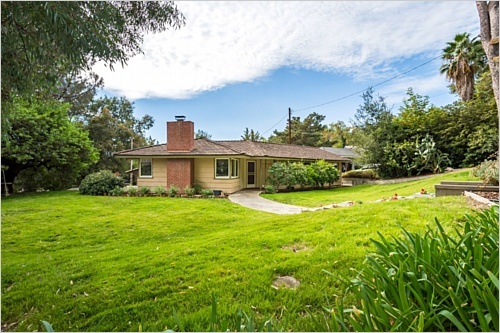 Fall in love with this wonderful home on a large lot with amazing mature trees in the Altadena estate area! 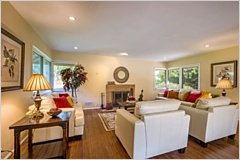 This home has been extensively remodeled with cook's kitchen, spacious living room w/ fireplace and recessed lighting, dining room with doors opening to the beautiful patio area, three bedrooms on the first level and a fourth bedroom, currently used as a family room, on the lower level. 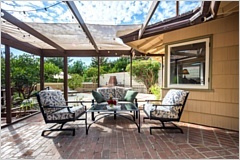 The outdoor spaces offer many sitting areas with beautiful views-- enjoy watching the birds play in the amazing pepper tree on the patio off the kitchen or outdoor dining and sunning on the large patios off the dining room. 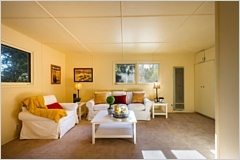 There is a separate large flat pad great for playing or gardening, along with a two car garage and storage shed. 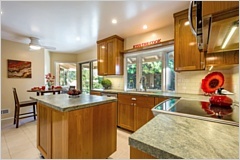 The gourmet kitchen features leather finish granite counters, subway tile backsplash, custom cherry cabinets, and high-end appliances, farmers sink, eating area and sliding door to the patio. 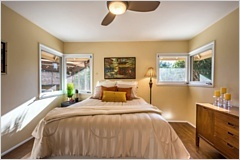 Features include bamboo flooring, dual pane windows, custom interior glass doors, ceiling fans in the master and second bedroom, large windows that bring the outdoors in, whole house attic fan, and easy access to schools, hiking, freeways & shopping. 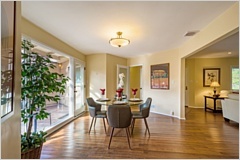 Don't miss this opportunity to live in the peace and quiet of Altadena!